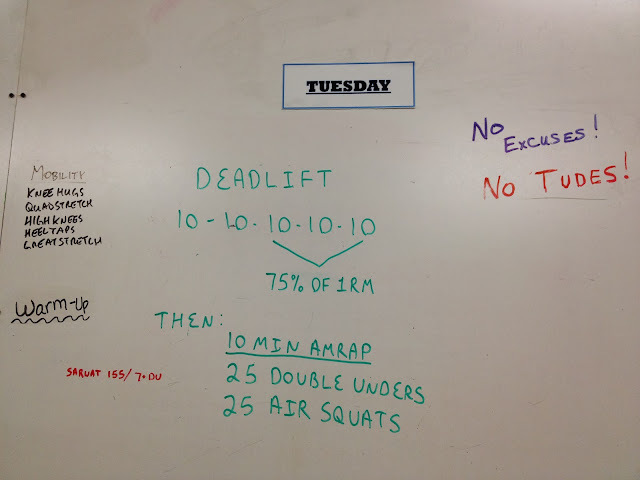 I had a good time on Tuesday because I got to do more deadlifts! I did 135 lbs for the first two sets and then 155 lbs for the last 3 sets. My lower back was not at 100% so I didn't try to go heavier- I think 75% of 1RM is somewhere around 160-165 lbs. At 155 lbs though, I felt like I did pretty good for 30 reps! I did 7 rounds and one last round of singles. I thought for sure that doing 175 air squats would leave me with the DOMS but nope! No soreness later at all, could it be that my muscles are finally used to this kind of work capacity?! That made me feel better. Now I have to see how much weight I can squat for high reps and not get the DOMS! I did another bike trainer workout in the evening and worked on my endurance pace. Luckily it is so cold here that it felt good to bike indoors! Making sure I always have some snack (approved snacks like my almost paleo egg muffins, yogurt with frozen fruit, Lim's rice cakes , mixed nuts, canned tuna, and whole wheat tortillas with almond butter) and water. I still need to think of more good snacks though. I definitely notice I eat worse when I don't drink enough water and don't have food ready. The rice cakes and tortilla are only for pre and post bike rides and long runs. Other than the rice cakes and tortillas, there will be no bread, no sugar, no pasta, no rice for the next 90 days. I still need some carbs though, so I will still have sweet potatoes and once in a while bananas in my protein shakes. 1. I reduced my calories to 1400-1500 and it sucked big time, I was waking up at 2-3 AM and just too hungry without knowing I was hungry. This time around, I will be sticking with 1800-1900 calories with an extra 100-200 if I do a long bike ride or run. 2. Reducing my carbs too much (< 100 grams) - this caused me to feel spacey and irritable during the day. I will never try this again, I need some carbs and will not deny myself. 3. Spacing out my meals too far apart, I have heard of the Warrior diet, intermittent fasting, etc. and this kind of eating schedule does not work for me. I don't know if it's because I'm a woman (men tend to have more success) or because my blood glucose levels are not regulated well enough to allow it but I know that it just makes me miserable, so I will not be doing any kind of fasts. I do know that if I eat 3 meals a day and one or two snacks, I feel better and that's what I will aim for. I also know that the busier I am, the more stringent I am with my eating so I plan to work hard not being a bum! All of this may be ambitious but I am feeling like this might be the year I'm successful at both the planning and execution!